In an inertial confinement fusion (ICF) experiment a small spherical target is imploded. The implosion is generated by depositing a large amount of energy on the surface of the target. In a laser driven ICF experiment, a finite number of laser beams strike the surface of the target at the same time. The outer portion of the target (a shell called the ablator) "explodes" which causes the inner portion of the target (the fuel) to accelerate inwards, resulting in an implosion. The implosion raises the pressure and temperature to levels where a nuclear fusion reaction occurs. Nuclear fusion is a cleaner process than nuclear fission, in that it generates less radioactive waste, and it is a promising source of energy to meet humanity's future needs. To learn more about inertial fusion energy click here, or visit the National Ignition Facility NIF. The interface between the ablator and the fuel is not perfectly smooth, but has a finite "roughness" where the two materials come together. Thus, the interface is viewed as having perturbations. When a shock wave passes through this interface, the shock deposits vorticity where ∇p x ∇ρ is nonzero. The shock induced baroclinic generation of vorticity at the interface causes the perturbations on the interface to grow in amplitude- this is known as the Richtmyer-Meshkov instability. 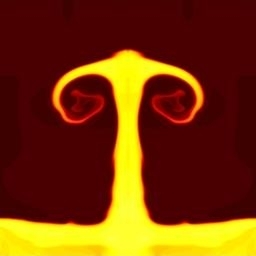 This instability is a concern in ICF experiments because the ablator becomes mixed with the fuel, diluting it, and a lower fusion yield is realized. An analogous instability is the Rayleigh-Taylor instability where a heavy fluid is above a light fluid, and the force of gravity causes the heavier fluid to fall, for example, water dripping from a ceiling. Understanding and quantifying the Richtmyer-Meshkov instability on a large scale in the shock tube should ultimately provide valuable insight into realizing higher yields in ICF experiments and increasing efficiency. For studying this instability in the shock tube, an interface (such as a nitrocellulose membrane) with a known perturbation (a sine wave) separates a light gas (helium) and a heavier gas (air) in the driven section. 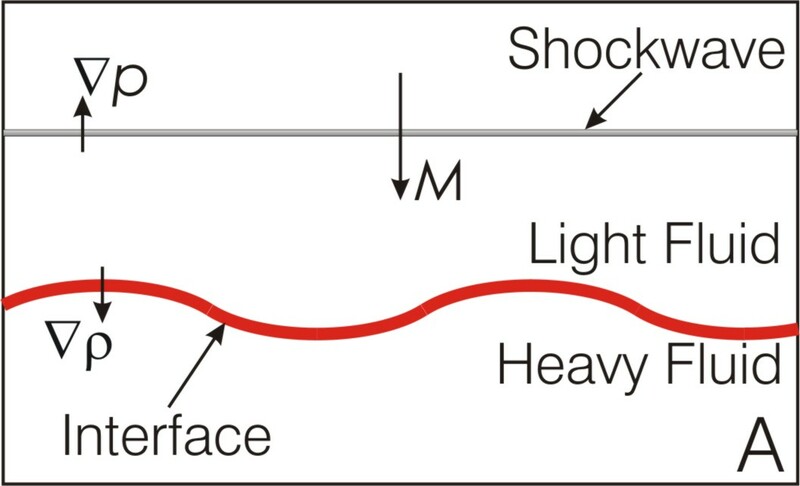 The shock wave, of strength M, formed by rupturing a diaphragm that separates the driver and the driven sections travels down the tube through the light gas, see Fig. A, and note that the perturbation amplitude is greatly exaggerated for illustrative purposes. The shock wave then passes through the interface and continues through the heavy gas. The interface, having been shocked, grows in amplitude. The initially sinusoidal interface will grow linearly to a certain point and then enter a nonlinear regime. 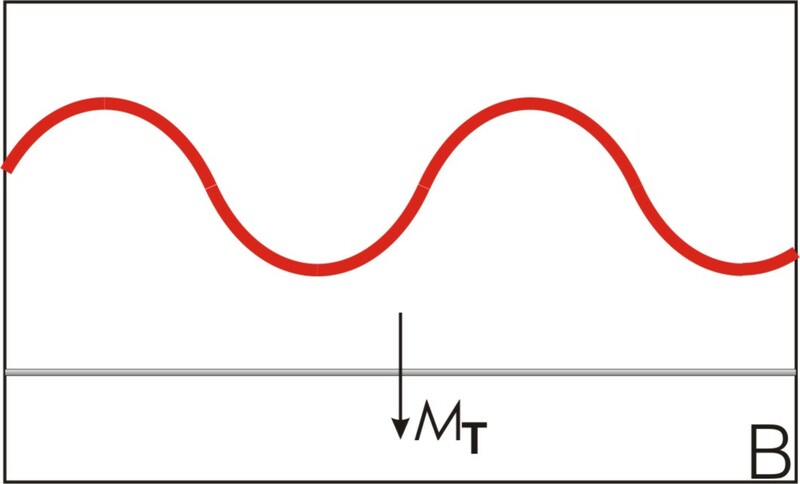 Figure B shows the transmitted shock wave (strength MT) and the interface, both the increase in amplitude and deviation from a sinusoid are illustrated. The perturbation growth rate at the interface and the mixing rate of the two gases can both be studied in the shock tube by placing the interface and/or test section at different locations. Thus, interfaces of different ages can be studied. A shock tube also provides an environment for studying the shock induced hydrodynamics which are decoupled from the plasma and radiation effects (all three of these effects are present in an ICF experiment). The instability development for an initially sinusoid perturbation is shown below. 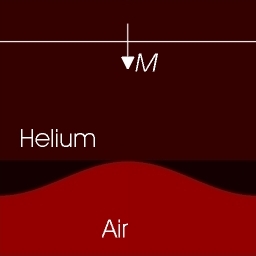 The interface is helium (above) and air (below) with a M=2.1 shock wave traveling downwards. The amplitude of the perturbation grows in time as the air (the heavier fluid) penetrates into the helium as a spike, and the vortex on each side of the spike entrains the air and results in a mushroom-like shape at later times.